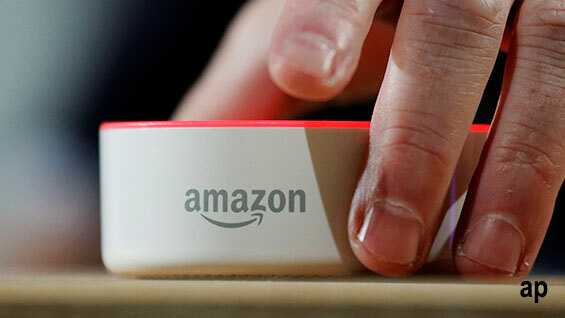 It was reported this week US tech giant Amazon is working on a patent under which its ubiquitous voice-activated assistant, Alexa, can tell when you're sick. It's thought the machine, with its mellifluous female voice and ability to answer any question we pose, will soon be able to detect changes in your voice brought on by illness. It will then recommend remedies that can be bought on Amazon. While tech news site CNET concedes the report is unconfirmed, it is potentially another example of the rapid advance in artificial intelligence (AI) and machine learning. From Japan's use of robots to perform intricate surgery and fill worker shortages brought on by an ageing population and declining birth rates to China’s use of facial recognition to spy on its sprawling citizenry, the development of AI is profound. For Sundar Pichai, the chief of internet search giant Google and leader in the field, AI ranks alongside fire and electricity for its potential to alter human destiny. But the evolution is far from perfect. For the sceptics, the hyperbole fails to match the concrete results. IBM's Watson technology, touted as a breakthrough cancer-detecting treatment, has been accused of misdiagnosing conditions. And as for self-driving cars, the world is not yet ready to forget the events of March this year in which a pedestrian was killed. The sunny investment horizon, too, shows patches of cloud. The unknowns in AI make it an alluring opportunity, and one that has led to some eye-watering returns and outlandish price earnings multiples. Nvidia, an American computer chip maker, has a price earnings multiple of 31.7 versus the sector average of 21.8, and it’s trading at US$245 against a Morningstar fair value rating of US$120. But as Platinum Asset Management co-founder chief Kerr Neilson says, "this stuff is going to happen". "Artificial intelligence is a complete game-changer. It's very deep-reaching and I think is even more significant than the mobile phone network," he says. "I think we'll see it creep up on us. And of course, as it does, the demand for chips and chip-making equipment could have a much longer duration than the typical cycle." And if the investment forecasts are anything to go by, Neilson is right. Robotics and AI are already disrupting many industries including manufacturing, healthcare, medicine, defence, education, transportation and agriculture. In its latest update, market forecaster Tractica says annual worldwide AI software revenue will grow from $5.4bn in 2017 to more than $105bn by 2025. And the robotics industry is forecast to reach $500bn by 2025 and a compound annual growth rate of 32 per cent a year. But to better grasp the investment potential and the options for Australian investors, it's first worth examining some of the vast and developing characteristics of AI and what it’s being used for. AI is essentially problem-solving software that mimics the human brain. It examines a problem, seeks to determine what is occurring and then learns from what has happened. "It's recognising your face in a photo; it’s translating a menu on your phone; it's using computer vision in self-driving cars to see what the other cars and obstacles are," says Bloomberg tech reporter Ashlee Vance. To do all that, the software relies on chips - central processing units (CPUs), or what Nvidia calls the "brains" of the computer, and graphic processing units (GPUs), or the "soul". In other words, as Morningstar analyst Abhinav Davuluri says, "to train a computer to recognise spoken words or images, it must be exposed to massive amounts of data with the goal of educating itself. Inference involves taking what the model learned during the training process and putting it into real-world applications to make decisions. After reviewing 10,000 cat pictures during training, is this next picture a cat?" Hence the term "machine learning". AI effectively "teaches robots to teach themselves," notes BetaShares' chief economist David Bassanese, "thereby enabling them to undertake tasks of ever greater complexity." There are few fields that will be left untouched by AI and robotics. 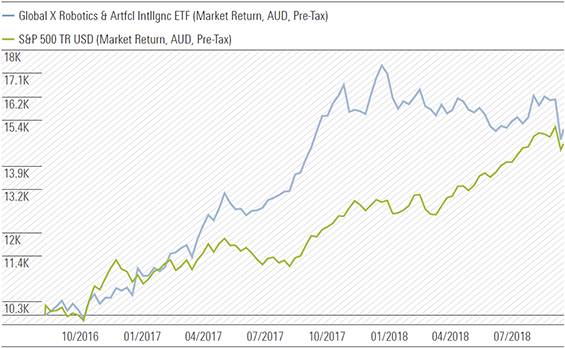 To that end, the BetaShares Global Robotics and Artificial Intelligence ETF (ASX: RBTZ) is among options providing investors exposure to a basket of companies across the world, covering several sectors, including manufacturing, defence, healthcare, transport, agriculture, and personal services. RBTZ provides exposure to companies specialising in industrial robots and production systems, autonomous vehicles and drones, voice-and-text recognition software, and medical robots and medical instruments. According to Bassanese, RBTZ offers diversification and complements another ETF, the BetaShares Nasdaq 100 ETF (ASX: NDQ), which has a large exposure to the US-based IT companies. In contrast, the index RBTZ aims to track has only about a 33 per cent exposure to the IT sector and a larger 47 per cent share to industrials. It also has a relatively large 43 per cent exposure to Japanese companies, compared to only a 33 per cent share to US companies. 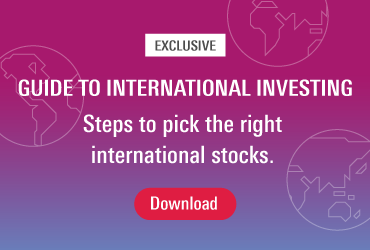 Another international option that’s attracting attention is the Global X Robotics and Artificial Intelligence ETF (BOTZ). It launched in September 2016 and like RBTZ, it has a strong weighting to industrials and technology in Japan (41 per cent) and the US (33 per cent). Its top ten holdings mirror that of RBTZ. In manufacturing, some of the companies RBTZ covers include Japan's FANUC Corporation, which produces robots to conduct large-scale manufacturing assembly work. According to the Boston Consulting Group, a quarter of US manufacturing operations will be automated by 2025, compared with only about one tenth in 2015. In defence, companies such as AeroVironment are developing drones and wheeled robots that can conduct reconnaissance missions without risk to human life. The US Army estimates the use of robots could allow around a 25 per cent reduction in the required size of combat teams by 2030. In healthcare, Japan's Nasdaq-listed Intuitive Surgical has developed robotic devices allowing surgeons to undertake once difficult operations – in areas such as heart and brain surgery – with greater precision and less patient risk than ever before. Intuitive Surgical received clearance from the US Food and Drug Administration for several products last quarter, among them the da Vinci SP (single- port) surgical system, which can now be used for urologic surgical procedures. In transport, AI-facilitated self-driving cars promise to revolutionise the transport industry, with some estimates suggesting they could account for 15 per cent of car sales worldwide by 2030. Earlier this month the US took a step further in legislating the Self-Drive Act, which could result in as many as 100,000 self-driving cars taking to the road by 2021 or 2022. While not covered in RBTZ, leading the pack is Google-owned Waymo, with General Motors, Tesla and Nissan not far behind. The Boston Consulting Group estimates by the end of the next decade, up to a quarter of the distances Americans travel by car will be logged by fully driverless vehicles operated by ride-sharing services such as Waymo, Uber, Lyft and GM’s Maven. In agriculture, robotic planting and harvesting machines are also anticipated to transform the agricultural sector. And, in personal services, some patients now rely on robots to provide 24-hour care and delivery of medicine. But perhaps the most telling indicator of the penetration of AI is the gusto with which China has adopted it. According to Tractica, the top "use case" for AI is video surveillance, outranking network and IT operations management, customer service and marketing virtual digital assistants, and voice/speech recognition. China accounts for half of the video-surveillance market today, with companies such as SenseTime and Megvii (Face++) collectively raising $2.5bn. Hence the fears around AI and its intrusion into our lives. The Middle Kingdom has rolled out a sweeping network of surveillance cameras, which it claims can scan and monitor its 1.4 billion population with up to 99.8 per cent accuracy. From the humble jaywalker to the displaced Uighur, the state apparatus is leveraging the power of AI to keep an eye on anything — and anyone — that moves.